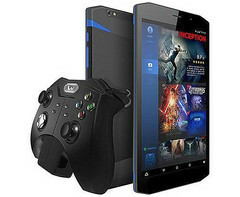 This 8-inch "3 in 1 phablet" comes only with Android 5.1, but offers 4G connectivity via a micro SIM card, HDMI output, and has a foldable/detachable/adaptable controller with two joysticks, one D-pad, and four action buttons. Those eager to get a Nintendo Switch have a few alternatives that can be already purchased, although most of them are products coming from various Chinese brands that nobody heard of, like today's WinkPax G1. Although it has been around for a while, the WinkPax G1 is now on sale and buying one for less than $210 USD is quite tempting. The strongest part of the WinkPax G1 is the bundled controller that can be split into two sections and each can be attached to a side of the tablet. Thanks to its HDMI output, it can also be used as a console, connected to a TV. GeekBuying has this slate ready to ship, and the price is currently down 39 percent, all the way to $208.99 USD. The product also comes with free shipping. Sadly, the regular price of $342.53 USD will be back in less than 24 hours.